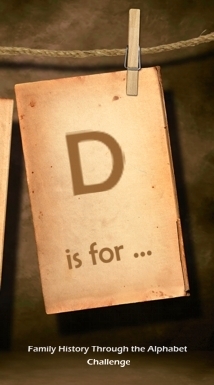 The weeks are flying by, and we’re already up to the letter ‘D’ in the Family History Through the Alphabet Challenge. If you’ve just discovered our “Alphabet Challenge“, please feel free to join in. It’s not hard, you just need to use the current letter for the current week (A, B, C etc. whatever we’re up to, right through to Z), and connect it to someone, something, or a topic relating to your family that you’d like write about. I’m totally loving the creativity of those who are taking part, on Facebook, Twitter and the geneabloggers. Already there has been everything from emigrant ships, attributes, alphabets, home towns, war memorials, websites, convicts, family heirlooms, very special ancestors even a sad story of being buried alive. And of course something all true genies can relate to … Addicted to genealogy. As with the earlier alphabet letters, we will list all posts from geneabloggers for the letter “D’ below. If you’re a tweeter, and wish to contribute or just follow the topic, follow the #fhalphabet hashtag. On Facebook, you can comment under each letter’s post. Are My Roots Showing?, D is for … DRILLER! I just posted my “D is for Dexter” post. This is the next post in my tour of streets in my life. http://findingeliza.com/archives/5506. Queensland Genealogy – D is for Dunwich Benevolent Asylum.